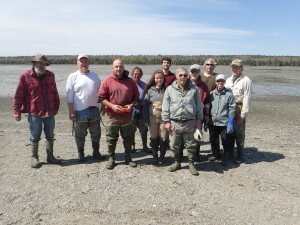 Thanks to the great participation by many, we had successful clam seeding and netting events this weekend at Raccoon Cove in Lamoine and Settler’s Landing in Hancock. Joe, Steve, and Bill led effort, Chris and students from COA did an initial survey for abundance, and Mark from the DEP measured pH at each plot. 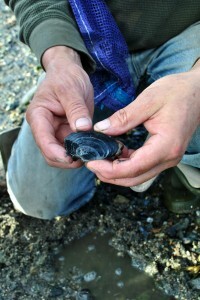 The 610 Project (pronounced six-ten) is a collaboration between the Partners, the Frenchman Bay Regional Shellfish Committee and the Hancock County Planning Commission to build capacity towards the goal of opening closed clam flats in Frenchman Bay. This project received its initial funding from the Maine Community Foundation’s Community Building Grant Program. 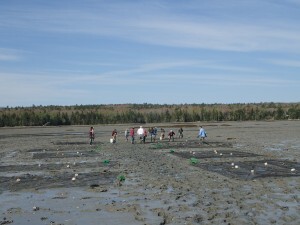 Through a conservation action planning process, the Partners and shellfish committee have identified the five-year goal of opening all 610 acres of clam flats in Frenchman Bay in which harvesting is restricted due to unknown bacterial pollution sources. They will accomplish this by building capacity within the shellfish committee for watershed surveys and organizational development.